Masanobu Fukuoka is one of the most radical and influential agrarian thinkers of this century. 'One Straw' describes the events that led to the development of Fukuoka's concept of 'natural farming'. In this book, he emphasises the basic principles of non-cultivation and non-chemical farming by the incorporation and controlled use of weeds rather than their eradication. Using these methods Fukuoka produces greater crops than achieved by chemically-based and modern farming practices. Year by year the soil becomes richer and more productive. This book should be compulsory reading for all who wish to bring about change, not only in agriculture, but also in how we view the entire process of food production. The One Straw Revolution is not exclusively about farming. In fact, there are many pages in which Fukoka expands on philosophy, history, nutrition, intentional communities, and sustainibility. Masanobu Fukoka was a laboratory agricultural scientist who worked on fighting plant diseases and he had many unanswered questions about the interrelationship between man and nature. After a long sabbatical he resigned from his position and took over his father's rice and mandarin-orange farm. Fukuoka thought that by putting his questions to action he might find the answers he sought. Fukoka was immediately drawn to organic and natural farming methods and over the years developed a type of natural farming, which he refers to as "do-nothing farming". Contrary to easy assumption, this method does involve work (albiet menial) and, at least in Fukoka's experience, the benefits largely outweigh the negatives. "The book is quite philosophical in nature and doesn't prescribe any step by step methods but more of a basic philosophy which is likely to confirm what the reader already knew. For people such as myself who sometimes pause to wonder why are we have chosen an ideology of self sufficiency, it is encouraging to read of the experiences of one who has already tread the arduous path and who offers words of reason that are simple and uncomplicated in this very complicated world. If there is a methodology prescribed in the book, it is the method of simplicity and it is printed in such a way that it can be adapted to our own unique circumstance. The forward, by Larry Korn, gives a profile of the nature of the book and Fukuoka's background I'll abbreviate:- In his younger days Mr Fukuoka's specialty was plant pathology and he spent a lot of time in research. Over 40 years he observed the Japanese nation abandoning their traditional farming methods and following the American model, both economic and industrial. He noticed this coincided with degradation of the land and society and so he returned to traditional methods and improved on many of the old ways to quote the forward by Larry Korn " He (Mr Fukuoka) considers the healing of the land and purification of the human spirit to be the same process". Fukuoka produces citrus and grains including rice, he believes in minimal interference to create a natural balance, he believes that upsetting the balance by using insecticides to destroy pests perpetuates a cycle of imbalance, creating a system permanently dependent on insecticides, which results in greater long term insect damage once predators are destroyed. The book also emphasizes the holistic nature of farming, as opposed to the scientific 'discriminating" approach where each "problem" is viewed by scientists in the context of their specific field of 'expertise' Fukuoka has had many 'experts' visit his property and they arrive in single file to study particular aspects in isolation, most "experts" are reported to be very impressed they take notes and then offer short term prescriptions for improving his system, based on their own unique scientific field. Needless to say none of those prescriptions have been applied. Masanobu Fukuoka also emphasizes the importance and sustainability of the small farm he recognizes that modern commercial agriculture has diminished the spiritual nature of farming and the underlying message seems to be the unsustainable nature of large farm mechanical operations. Fukuoka's book also goes on to speak of increasing concern in Japan about the deterioration of the environment, contamination of food, the large amounts of chemical fertilisers being, used of which only a small portion is being used by the plant life while the excess leaches into seas and rivers. Throughout the book Fukuoka highlights Soil improvement as the basis to success, he emphasizes the importance of spreading straw, growing clover, producing compost and returning organic matter back to the Earth. He concludes that artificial fertilizers, though effective in the short term, ultimately lead to long term soil degradation and depletion, causing the Earth to lose vitality. Fukuoka believes that the soils can be planted continuously and in such away that it will continually improve, by enriching the soil using of cover crops and there is also a chapter on growing rice in a dry field. Although the book was written more than 20 years ago the message is becoming increasingly important today, especially in the light of such issues as the various current food crises including Genetic Engineering and the cattle feed contamination crises in Europe and the un-natural manner in which animals are farmed these days. There is also reference to the impact of consumer demands and the range of chemicals that have been introduced in response to consumer preference so produce looks more marketable. In striving to meet those demands, farmers are caught in a cycle where they do too much when they could be thinking in ways that will enable them to do less. The basic principals of the book are no cultivation, no chemical fertilizer, incorporating useful weeds and controlling, rather than eradicating, them, including animals and various manures. He also advocates growing veges in a semi-wild way, allowing veges to grow among weeds, using weeds as mulch, cutting them down, to fall and so enrich the soil and plantings. 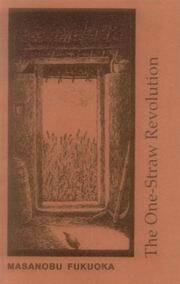 In short, The One Straw Revolution will probably just confirm for you what you already know, but when one is weary or wondering, and daily engaged in a lofty apprenticeship to the land, it provides inspiration that we must be on the right track, because it is a track that is well worn by generations of peoples all over the world." This is the Mother of all books on organic farming and understanding nature from a pure Zen and Vedantic perspective. Fukuoka was the seed on this generation for the organic revolution we are now in the midst of. This book reads like a beautiful poem of existence, through tis words we enter the world as he understands it, the very breath of nature. I read it first in India and felt the timeless wisdom it shared. It is a rare treasure and joy and something unique. I felt immense grattitude for the greatness of nature, and Her child, Masanobu Fukuoka.